(1) there were some hackers' scores in front of me and I wasn't sure whose scores were fake then. 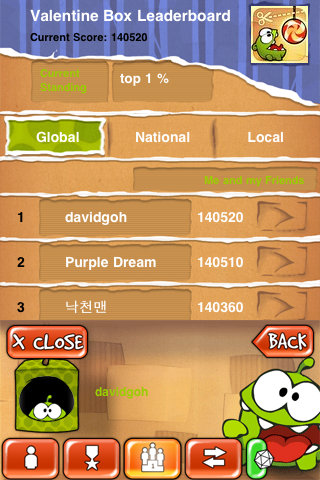 (3) I encountered a "high score updating" bug in ver. 1.2 and I had to replay all over again (read my next post). (4) later I discovered that the gameplay is slightly different for different devices, like between iPhone 3G and iPhone 4/4S, so it's very difficult to explain all the techniques which you can use for each level unless I own all the various iOS devices. I already emailed the ZeptoLab staff (creator of the game) on 18th Apr 2011 but after more than 1 year (ver. 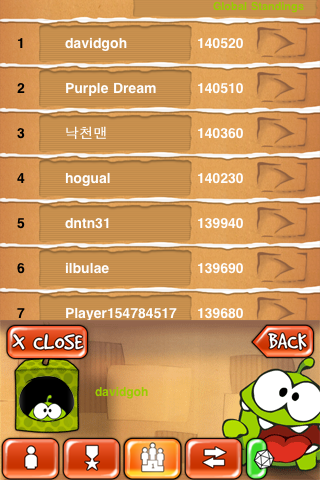 1.9 of "Cut The Rope" just came out), they still haven't fixed this problem yet. Maybe this is a difficult problem to fix, so unfortunately you cannot really compare the scores for the "Cut The Rope" games because the game physics is slightly different for different devices. Moreover, they're porting the games to more and more platforms and devices. For those versions which use "mouse" to play and for some older types of "Google Android" devices which don't support "multi-touch", you cannot perform multiple actions at the same time like the iOS devices, so you would definitely get lower scores for those levels where you can perform simultaneous actions to speed up the level completion. After all the delay, I feel that I should just write up whatever I want to say about this game, especially the scores and some of the tips and tricks in the game.